Tamils all over the world will be commemorating the 35th anniversary of the HOLOCAUST 1983 where theTamils Shops, Offices and Restaurants in the Capital’s crowded City Centre and Main Streets were burnt while the Police looked on, thousands of houses ransacked and burnt, sometimes with women and children inside. 25th July was the fateful day for Tamil people in Sri Lanka for it left them without a STATE. Tamils fear in 1977 when the elected Tamil leadership under Samuel JAMES Velupillai Chelvanayagam Q.C unequivocally declared ““THERE IS ONLY ONE ALTERNATIVE AND THAT IS TO PROCLAIM WITH THE STAMP OF FINALITY AND FORTITUDE THAT WE ALONE SHALL RULE OVER THE LAND OUR FOREFATHERS RULED ..THE TAMIL NATION MUST TAKE A DECISION TO ESTABLUISH ITS LOST SOVERIGNTY ON ITS HOMELAND ON THE BASIS OF RIGHT TO SELF-DETERMINATION’. The real erosion of democracy in Sri Lanka actually began in 1956 with attempts through pogroms in 1956, 1958, 1971, 1977, 1981 using hoodlums to intimidate and silence the Tamil people in their legitimate constitutional demands closing all avenues to discussion and debate. The Sri Lankan Government in order to suppress the legitimate demand and struggle for self-determination passed the sixth amendment to the constitution of Sri Lanka. 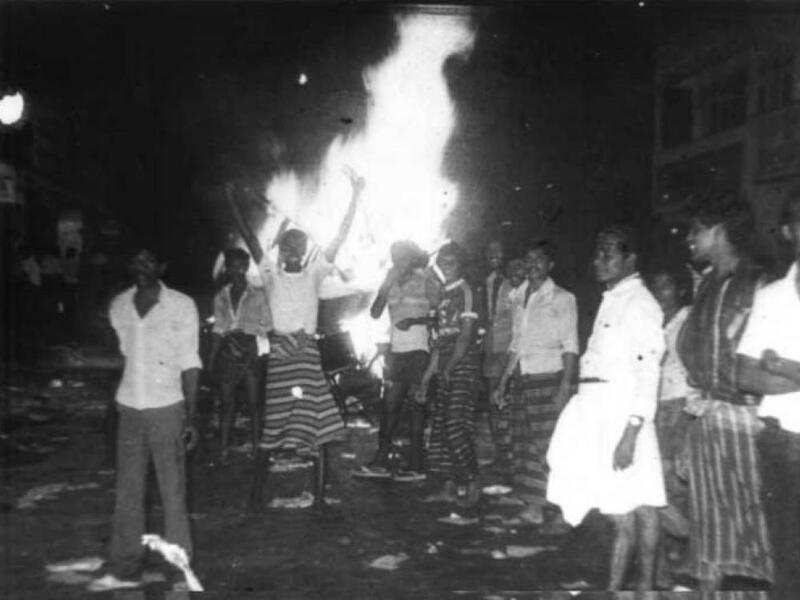 justifying them as a normal reaction of Sinhalese to take revenge on innocent Tamils, hurriedly passed the 6th Amendment to the constitution in August 1983 to stifle the voice of Tamils. “No person shall directly or indirectly in or outside Sri Lanka, support, espouse, promote, finance, encourage or advocate the establishment of a separate state within the territory of Sri Lanka which if found guilty could strip his/her civic rights etc. The security forces have gone berserk each time a soldier was killed in attacks and counter attacks between them and LTTE – going for innocent bystanders, setting the place on fire and destroying everything in their path leaving behind only “rubble and “devastation”. Massacre inside the maximum security prison in Welikada. BLCAK JULY 1983 – As reported by International mass media. The Daily Express – August 29, 1983. “A tourist told yesterday how she watched in horror as a Sinhala mob deliberately burned alive a bus-load of Tamils … there was no mercy, women, children and old people were slaughtered. Police and soldiers did nothing to stop the genocide. The scale and size of terrorism in Sri Lanka is not such as to constitute a public emergency threatening the life of the nation …. and so does not justify the measures permanently derogating from the rights guaranteed by the Covenant ..
Tamils are still waiting for JUSTICE AND ACCOUNTABILITY for the crimes committed against them since 1948. Kumarathasan Rasingamis a Senior Citizen of Canada, Human rights activist, Former President of the Tamil Canadian Elders for Human Rights Org.